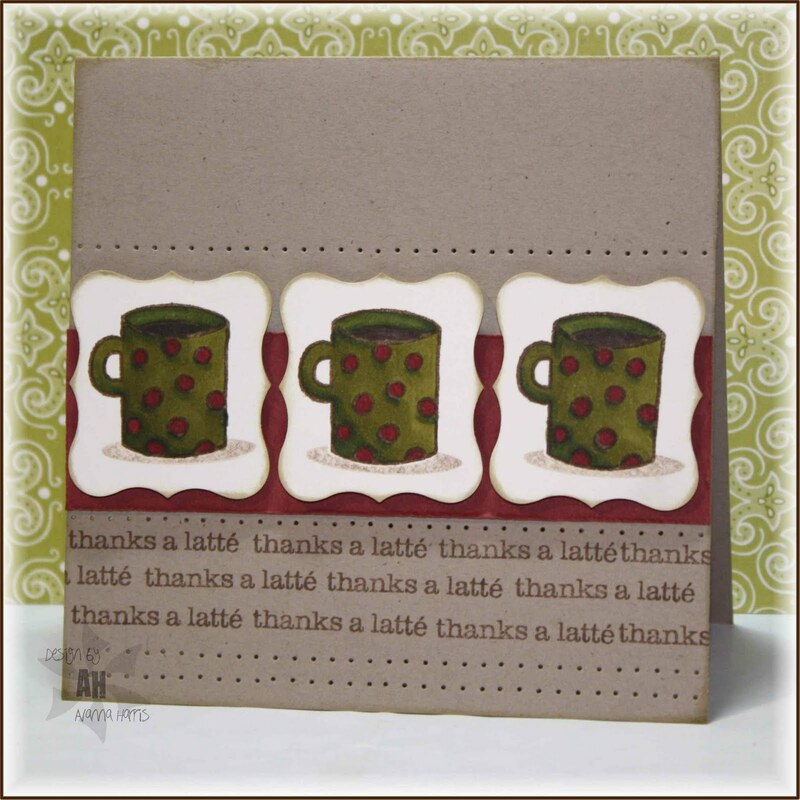 I can't stop buying A muse stamps...I got a wee shipment in the mail from tamijo on SCS - the clear coffee break set. Had to ink it up tonight...perfect for a friend who just returned from Cuba and brought me back a gorgeous little espresso cup. Also perfect for this month's A muse Lounge Challenge, "2, 4, 6, 8, Who Do We Appreciate?" I stamped the sentiment repeatedly along the bottom third of the card. Thank goodness for my Tim Holtz ruler - amazingly easy to line up images so they are straight. I added a strip of red under the "funky squares" because they seemed too stark white compared to the rest of the card. Then I used the ruler again to pierce lines above and below the sentiment & the images. Hope you like it!! Love coffee cards, great idea to make that stamp repeat! Might steal that idea! I'm sorry to say that my version of the repetition with I Like It A Latte didn't turn out as well as yours. Thanks for your comments on my blog- you should check out the W Plus 9 stamps, the woodgrain is party of the circle/flower stamp, too much fun! Fantastic card! Will have to pull out this set and CASE this. :) Just found your blog via Simplicity. I love A Muse so am getting some great ideas!